ITV has reportedly decided to drop subscription charges for users of Friends Reunited in an attempt to turn around the site’s fortunes. According to the Guardian, the site will ditch the £7.50 charge for a six month membership, which entitles members to contact other users of the site. 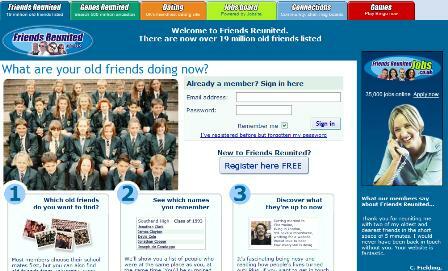 Friends Reunited launched in 2000 and grew rapidly – it had around 15m registered users when ITV acquired the site for £120m in 2005. But things have moved on and the site’s user numbers have since declined to around 9m. In August, stats from Nielsen//NetRatings showed Friends Reunited had just 2.1m unique users in the UK, compared to 6.4m for MySpace and 6.5m for Facebook. Revenues for the site rose by 38% in the first half of the year to £11m, however, and it currently has around 1.8m paying subscribers. Over 1700 public sector employees have apparently been disciplined for ‘internet abuse’ in the past three years, while unions are reporting a greater number of disputes between workers and their bosses. Right, time to challenge my attention span, concentrate and share some thoughts about our Harnessing the Power of Social Media event last week. UK etailers are attracting more and more business from social networking sites like Facebook, Bebo and MySpace, according to new stats from Hitwise. The data shows that the amount of UK web traffic retailers receive from social networks increased by 153% in the first nine months of this year.